After successfully recovering one of seven artifacts hidden around the United States by the Founders, three young adventurers travel to Glacier National Park to find the second, following series opener The Eureka Key (2016). Marty, with her glasses and witty T-shirts, is the trivia buff. Theo is the stoic muscle. Sam is the irreverent puzzle master with a sweet tooth. Together they make a formidable team. Unfortunately, they are not alone in their quest. Gideon Arnold, descendent of the notorious traitor, is equally anxious to gather the hidden objects of power. The trio is close to success when Gideon’s goons strike, capturing both their chaperone and the couple tasked with keeping Thomas Jefferson’s quill safe. 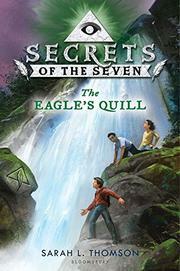 Sam, Martina, Theo, and their new friend Abby will need their combined skills if they are to find the quill and exchange it for the hostages. The high-stakes adventure is filled with historical trivia, cyphers, puzzles, and near-death experiences. While the characters are somewhat clichéd and the puzzles are often obvious, the historical commentary will have readers thinking about familiar historical figures in new ways, as when black Theo forces Sam and Marty, both evidently white, to confront Thomas Jefferson as slaveholder as well as statesman. Fans of the National Treasure franchise and Indiana Jones will relish this adventure centered on historical artifacts.